Social media and politics were made for each other. After all, when politicians get on their soapboxes, typically labeled CBS, NBC, ABC, CNN, FNN, et. al., the masses get on theirs named Facebook, LinkedIn, and yes, the insta-poll of all social media, Twitter. 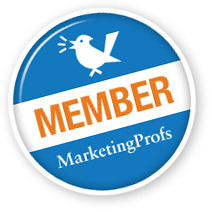 Here are two lessons for effective social media management– pre and post crisis. 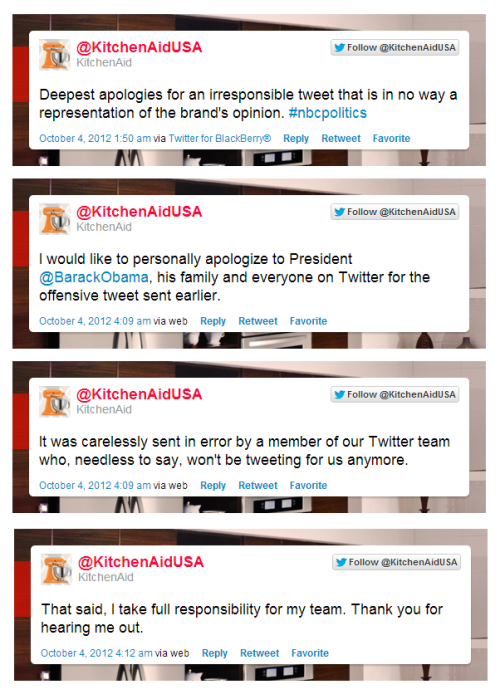 By now, you’ve heard of KitchenAid‘s unfortunate social media faux-pas. During one of the biggest media events in the past four years this obviously unintended ugly tweet was issued from the@KitchenAid Twitter account: I say unintended because from the moment I saw the tweet, as someone who has manned multiple social media accounts for employers and clients, I knew exactly what happened. Just about everyone who handles multiple social media accounts uses some kind of console, a social media content management system such as Hootsuite, Tweetdeck, or one of the other more sophisticated systems such as Sprout Social. I have no knowledge of which system the KitchenAid tweeter used (and keep in mind, it may not have even been a KitchenAid employee who did this, but someone at a social media agency) but I am certain s/he had both the KitchenAid account and a personal account loaded on the same tool, and simply forgot to switch from one to the other. Don’t let employees, or agents, mix business and personal social media accounts on the same management tool. Of course, the social media world exploded with criticism. But what happened next is a good primer for others on what to do when the Tweet hits the fan:. Eight minutes later, the offending tweet was pulled and the first of a series of apology tweets were issued by Cynthia Soledad, the brand manager Click image to see larger version): This is a great example of digital damage control. No half-baked excuses. 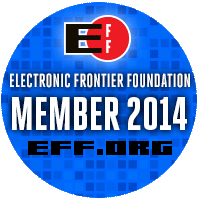 No “we were hacked” knee-jerk response. A quick reply, with apology, from a real person who can be contacted for more info. Respond quickly, honestly and appropriately. All of the above: brand damaging post on a social media site; remedial action; full accountability; full transparency — all leading to dousing the fire — happened in less that 2.5 hours. In social media as in life, accidents will happen. KitchenAid’s response is a lesson for all.